By a lucky chance, Weenies On The Water was open today for lunch. Owner and self em-ployed architect Jeff Dood greeted me with a friendly personality and recommended “The Panini Weenie”. I wasn’t able to eat it on the focaccia bread because of my basil allergy, but he grilled up on a delicious and buttery bun. 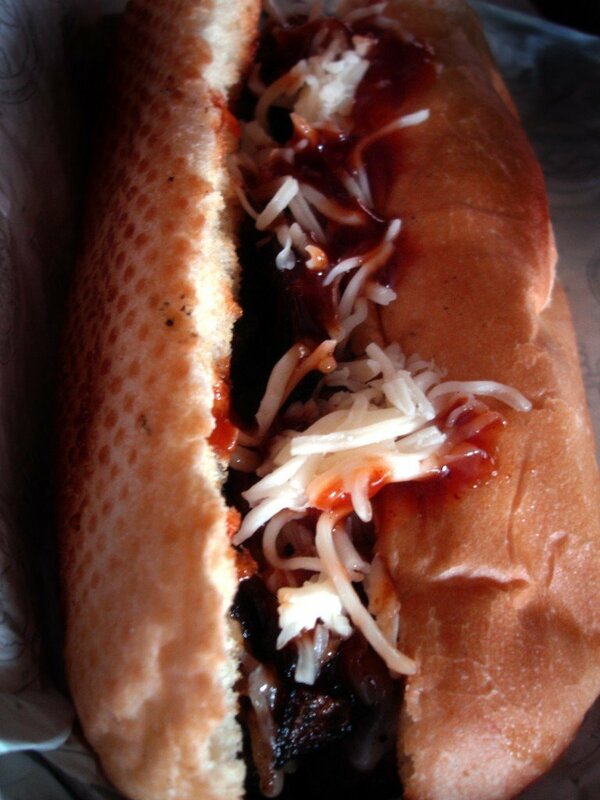 The onions and and cheese played nice under the barbecue sauce and ‘frankly’ was the perfect topping selection to accompany that awesome thick and juicy dog. The meat was just salty enough. It cracked when I bit into it and was a mess in my to-go container that I was happy to clean up. The price was $6 $5! He marked it down as the menu had his ‘on the water’ prices. Land=Cheaper…I dig! 8/10 finger-lickin’s! I’ll be back to try the other weenies soon. Finally, I’ve reached the last food cart in the Green Castle Food Court…oh wait. They are installing 2 more? Looks like these reviews will be going on for a little longer. A moment of your time, por favor?